VietNamNet Bridge – Twenty candidates for the Vietnamese Golden Ball Award have been announced by the organising Sài Gòn Giải Phóng newspaper. V. League 1 defending champions Ha Noi FC contributed six candidates including Hoang Vu Samson, Nguyen Van Quyet, Tran Dinh Trong, Do Duy Manh, Doan Van Hau and Nguyen Quang Hai. Favourite Hoang Anh Gia Lai had also four names in the list. They are Nguyen Cong Phuong, Vu Van Thanh, Nguyen Van Toan and Luong Xuan Truong. Binh Duong, Song Lam Nghe An and FLC Thanh Hoa had two players each, while Hai Phong, Quang Ninh, Quang Nam and Da Nang had one player each. Dinh Thanh Trung, who won the award last year, was included in the list. 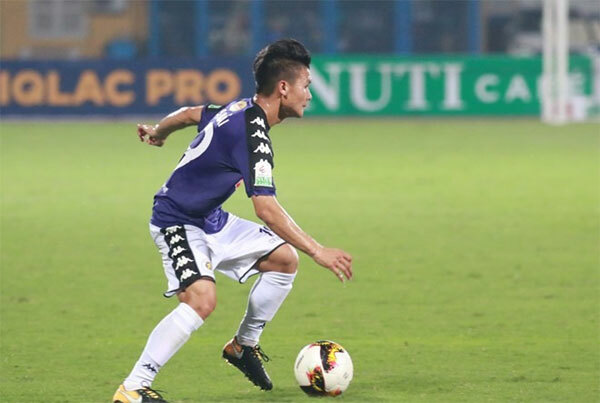 However, he is unlikely to defend his title this year following an unsuccessful season with Quang Nam in which he was not called up to compete in the ongoing AFF Suzuki Cup. Notably, 16 of the 20 players in the list are playing in the AFF Cup. Voters for the award include football experts, head coaches, coaches and captains of the national premier league and futsal clubs and reputable sports journalists around the nation. The awards gala will take place on December 22 in HCM City. Vietnamese Golden Ball Award was first started in 1995 by Sài Gòn Giải Phóng and was recognised by the Viet Nam Football Federation (VFF).